Keeping your pantry organized isn’t difficult, you just need to maintain the systems that you have in place. 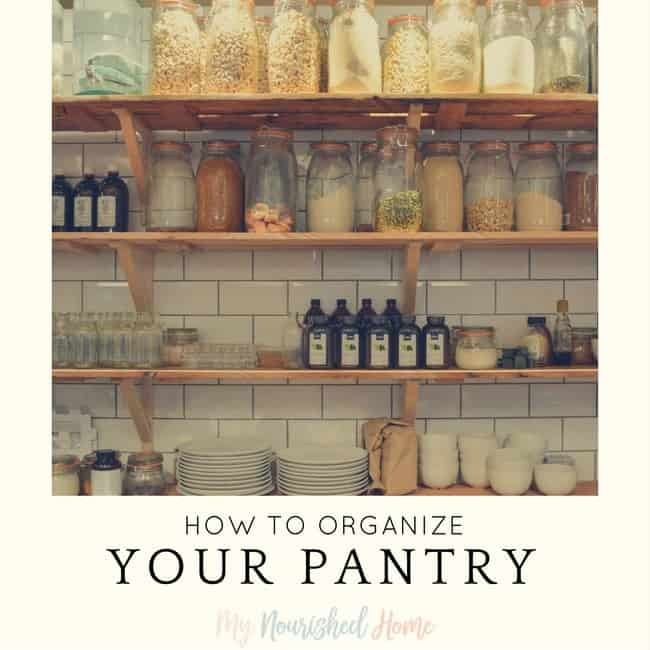 If you don’t already know how to organize your pantry, we can teach you! You might need to spend a few minutes each day checking and tidying the pantry to ensure that it works for your family and not against them! Finding the right option that works for your family is important. Do you store all your food in here? Or are there shelves and cabinets around the kitchen? Do you allow children access to help themselves? If so, are their things that need to be out of thier reach? How does it currently work? Is there a system in place or is it a free for all?! If you like to plan your meals in advance, it is a great idea to make sure you have ingredients that you will need. By placing the ingredients for each meal into a box, labeled with the day and the meal, makes it is easy to grab the basket and start preparing your dinner. This is great if you share the cooking, others will know what is for dinner without having to ask. It does take more organization and preparation time to keep the baskets full and ready to go – but imagine coming home from the grocery store, popping the ingredients for each meal you’ve already shopped for in a box labeled by day as you put away groceries. Now imagine how easy dinner is to cook the rest of the week! However, you do need to consider how you intend to store and display the items so they are easy to access. For example, cooking oils I rarely use go on the top shelf. But snacks for the kids are located on a shelf they can reach. They are also encouraged to make their own breakfast when they get up on the weekend so we make sure they can reach options we approve of! If you need storage containers, remember to choose square ones, as these will stack and fit better on any shelving compared to round containers! Organize your pantry if you want to avoid the can of tomatoes that is six years old. You must consider pantry rotation, this ensures that you are using the oldest items first! We all have staples we use all the time – cans of tomatoes and beans for quick meals, oats, dried beans, grains, flours and corn meal. When you are replacing anything that is not quite gone, make sure you store the new packages behind what currently exists in your pantry. By using the oldest item first, you will not be left with out of date food in your pantry, which is a complete waste of money! Grocery stores follow this same model to prevent out of date food and spoilage. So load to the back and pull from the front! Using storage containers is a great idea, they can make a space so much easier to work with. I have open, clear bins on the shelves in my pantry so that things are easy to see and find… but confined! Label your bins so when you have helpers putting away groceries, they know where things go. I keep a bin for packaged grains like oats, rice, couscous, and quinoa. One for dried fruit and nuts. And one for kid snacks like crackers and cereal bars. Note: we limit sweets around here. So there is another bin on the top shelf that is not clear to store any sweets out of site until we want the kids to have them. 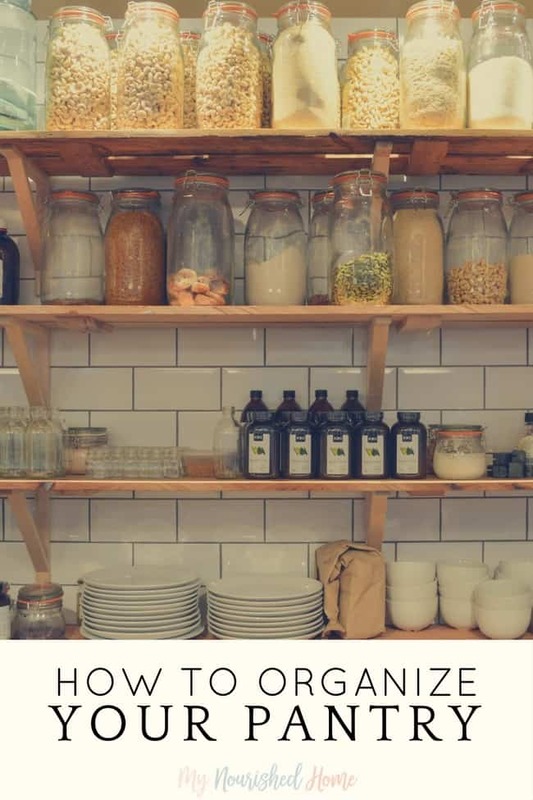 Keeping an inventory of all the things in your pantry is a great idea, it allows you to see what you need to replace and if there are any items that need using up. We have also painted the inside of our pantry door with chalk paint and everyone writes on the inside of the door if there are things that need to be replaced next time we go to the store. This is a handy trick for the primary grocery shopper (that’s me!) If I am in a hurry to leave, I literally take a photo of the list inside the pantry door with my camera phone. Do you need more organization ideas?